This one really shouldn’t come as a surprise. 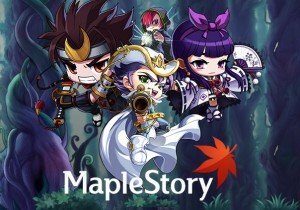 MapleStory is enormously successful in both South Korea and In North America. The game boasts over 100 million accounts worldwide. In case you haven’t heard of MapleStory, it’s a 2D side-scrolling fantasy MMORPG with cartoony graphics. This one may be a bit of a surprise to us Western gamers. Sudden Attack is available in North America but it’s not that popular. In Korea though, Sudden Attack is as popular as Counter-Strike. Sudden Attack is one of the major games in the ‘competitive gaming’ leagues in Korea. Graphically speaking, Sudden Attack looks a bit newer than CS 1.6 but worse than CS: Source. It’s currently being published by GameHi in North America. Kart Rider was available in North America for a brief period years ago, but disappeared without any proper announcements. The game is a huge sensation in Korea, as some news outlets actually claim that around 1/3 of Korea’s entire population has at one point played Kart Rider. The game is a Mario-kart style racing MMO published by Nexon. This one came as a huge surprise to me. Personally, I’m a big fan of FreeStyle: Street Basketball, but the game isn’t at all popular in North America. It used to be published by Sierra Online here, but they shut it down and GameKiss picked up the service. In Korea, the game is incredibly popular. It has many more features than the latest North American version of the game. As the game’s name suggests, FreeStyle is a basketball themed MMO. Prius Online is a 3D fantasy MMORPG that’s popular in Korea but not yet available in North America. It’s published by Netmarble and offers a unique pet system. The game actually made the news recently, as a Korean couple actually let their child die from neglect while playing the game at a local internet cafe for hours on end. This list was compiled using the top most searched games in Korea on Daum.net. The list changes periodically based on the time of day, so this list isn’t ‘perfect’ but is still useful for getting an idea of what MMOs are popular in Korea. Two other games were extremely popular, but didn’t quite make the list. They were Tales Runner and Dragon Ball Online. Zul’Jin is a ranged assassin from the Warcraft universe.